1. Almost everything, ever, from 101 Cookbooks because even though I love Heidi (Heidi, will you be in my rock band too? ), I’m always short just one teaspoon of dried rose petals or a half cup of olive blossom honey or saffron harvested from Morocco. 2. 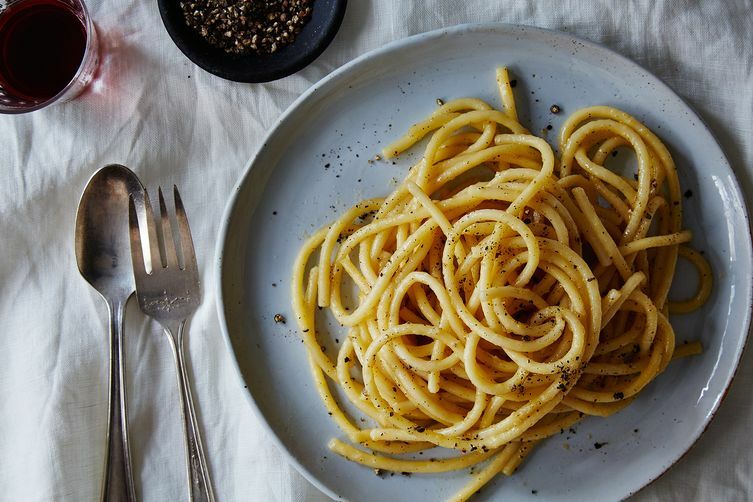 Cacio e pepe, but only perfectly cooked at 2 A.M. for some type of romantic guest. In my mind’s version of this movie, I say in my sultriest voice and with an Italian inflection I certainly do not have: Are you hungry? Do you want me to feed you cacio e pepe? Then I expertly whip it up and we slurp it from deep, fancy porcelain bowls I just happen to have lying around. I don’t need to explain more about why this has never happened, right? 3. Burnt Toast ice cream, which I thought would be cool to develop for the release of our ice cream episode of Burnt Toast, but clearly never did. “Make burtn toast ice cream!!!!!!!! !” [sic] can still be found on my Google tasks list, weeping like a cast-away cone but still holding on—because, you know, maybe one day I’ll wake up and actually own an ice cream maker. If that day ever comes, you will be the first to know. 4. 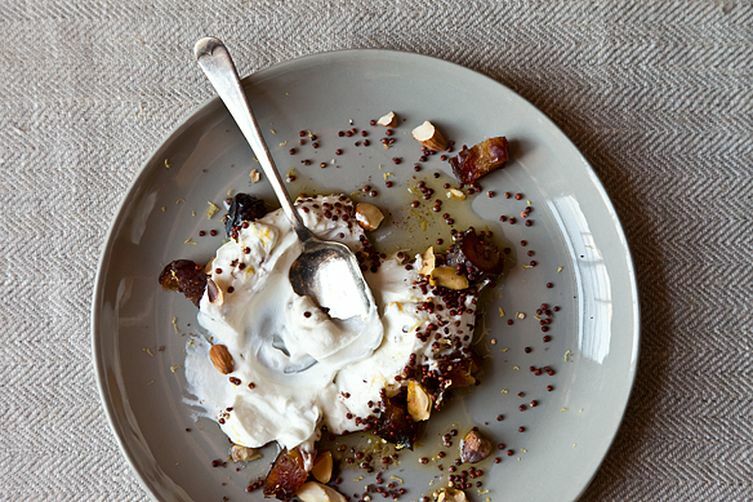 Amanda’s beautiful quinoa yogurt thing, the swirl of which I have admired since I begged to be an intern at Food52. I'd stare deeply into that swirl and dream about being a clog-wearing food stylist with a cottage upstate, but I’ve never made it because I’ve never not felt twee reading the ingredient list. Don’t tell Amanda, but I will probably never cook anything that calls for five pistachios, two dates, and a half tablespoon (a half tablespoon!) of red quinoa. What if I only have white? What if I don’t even own a vessel that splits a tablespoon in half? Do they even make that? What if I want six pistachios? These are the questions I sob into my bowl of Cinnamon Toast Crunch. 6. The simple carrot salad from Orangette. Though, perhaps because I had read the post so many times trying to become Molly Wizenberg through osmosis I assumed I had made it, and began talking about it like I was some kind of old pro: This is so perfect for a picnic, but they key is that it gets better as it sits. Oh, and I love to take this on planes. Because I’m definitely the kind of person who makes salade de carottes râpées in advance of plane travel. I can’t even say salade de carottes râpées. 7. A cherry slab pie, cherry because I was going to Seattle and what else do you do in Seattle but buy road-side stands out of their cherries? Slab because I had a big group of people to impress. I would do it discreetly and quickly and calmly so it would be authentic when I later said “Oh, this? It was no big deal!” It was a big deal. Instead I made this blessed potato salad for the 80th time this summer. 8. 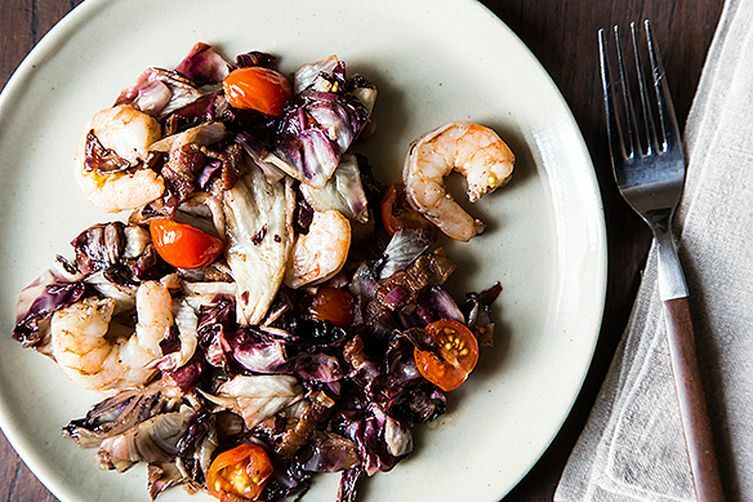 This magical shrimp and radicchio situation from EmilyC, because even though I ate half the tray when we took its photo, I still have an internal struggle every time I try to buy shrimp, as in: Is my dinner happiness really worth $15 a pound? Should I also light myself some candles and get out the fancy wine? How much Cinnamon Toast Crunch do I have left? Last time I walked by the fish counter four times before walking out of the store empty-handed. **Do you know how many days it takes to make cassoulet? I started the Sisyphean casserole journey last winter. On the first day, my spirits were high, my beans were soaking, my confit was prepped. On the second day, I started to talk about it like it was an annoying kid sister I had to babysit. It was so needy. On the third day, I threw caution to wind, dumped cooked beans and sausage into a cast-iron pan, buried them under a mountain of breadcrumbs, and ate the whole mess with an egg on top a day later. (David Lebovitz, shield your eyes!) I never was that good at babysitting. What are the dishes on your list you still haven't made? This is a safe space. Want to see my recipe box? I travel through it on occasion and re-visit all the things I want bake and cook and eat. If I didn't make it within two weeks of writing the recipe on a card--it's not going to happen. Right now, I am wondering if I should make the crab apple juice in the fridge into jelly even though the juice isn't very tasty. A friend recommended mixing the juice with vodka--skip the making jelly. Loved this article! Like confessing to having the stash of uncompleted craft or needlepoint projects in the back of the closet that I will get to "some day." I have never roasted red peppers and have been meaning to for over 20 years! It's just so much easier to open a jar. So many recipes, so little time! Alas. This soooo hits the nail on the head! I just want great food with the "more or less" normal ingredients I have generally in my kitchen. Exotic ingredients, or even a list of 10 ingredients or more, is enough to make me re-think my enthusiasm!! Thanks for this!! Just so relieved (and humored!) to read this! every pancake and waffle recipe I've ever lusted after and/or saved. just. never. have. patience. Loved your article. It certainly speaks to me as I'm sure it does to many others. My list starts with a dessert called Esterhazy Torte. I will get to one fine day, But before I owned an Ice cream machine I always made it in two Ziplock bags. I would place the cooked cream mixture in a small ZL bag and put about two cups of ice and salt in a large ZL bag. Place the small one into the large one (making sure that it is sealed tightly) and manipulate them for 5 to 10 minutes. ( wear gloves for this as it gets very cold) and be sure to rinse the small bag when you take it out. Voila! Ice cream. You are wonderful ;-) Really great to read your confession. I too have not attempted cassoulet - just too much. And so much meat in one pot - argh. And though I have a Donvier ice cream maker, have not made ice cream for years since my kids left (sniff, boo hoo). But my neighbour makes ice cream lots. I'm with you re: the 5 pistachios, etc. Burned toast ice cream? Jeeze. This is the best piece of writing I've savoured and sniggered with in a long time. I have yet to make some of the exotic Thai dishes that I bought all the ingredients AND the equipment for over a year ago - but maybe they will still be good one day soon .... Love the article- inspired me to keep thinking of what I may make one day. Hahaha, still laughing and now have a "slight" craving for cinnamon toast cereal! You had me on the 1st on the list. Italian meringue icing and macarons are on my list. I prefer whipped cream/cream cheese frosting or combo of. If I am going to beat so many egg whites I just want to make and eat a Pavlova! I want to eat a SELECTION of macarons, not just one flavour and I KNOW they could not possibly be as good as Pierre Herme ones or the La Maison du Chocolate ones that always have a layer of chocolate ganache in them regardless of the flavour. You do deserve to buy and eat Prawns! Thank you for a great read Kenzi! I love this piece! I am laughing so hard in personal recognition, and I love that you work for Food52 and also feel this way. I have indeed cooked many of Heidi Swanson's recipes, but seem to have a curated collection of those that do not involve rose water etc. There are so many things I could list of my own recipes I've never cooked, but the first thing that springs to mind is anything with Harissa. Yes, I know, I am more than late to the party, but I do not own any harissa and never have. It makes it very difficult to cook Ottolenghi et al. Someday I will get harissa'd. after making Sara Moulton's quick cassoulet I will never bother with the other. I used whatever sausage I can get-currently bison/pork. http://saramoulton.com/2013/02/chicken-cassoulet/. I've never made tomato-based pasta sauce from scratch. It looks so easy but somehow I always make an excuse to myself. this is why you need to make the Marcella Hazan butter-onion-tomato sauce. incredibly easy and so good. perfect homemade sauce for lazy people. I always made the 4 hour pasta sauce that I learned from growing up in an Italian household until I saw a video on yahoo of Fabio Viviani's homemade pasta sauce. Sooooo easy, sooooo fast. It's the only way that I make it any more. See if you can find this video. you'll be glad that you did. Octopus. ..did not want someone's arm on a plate.